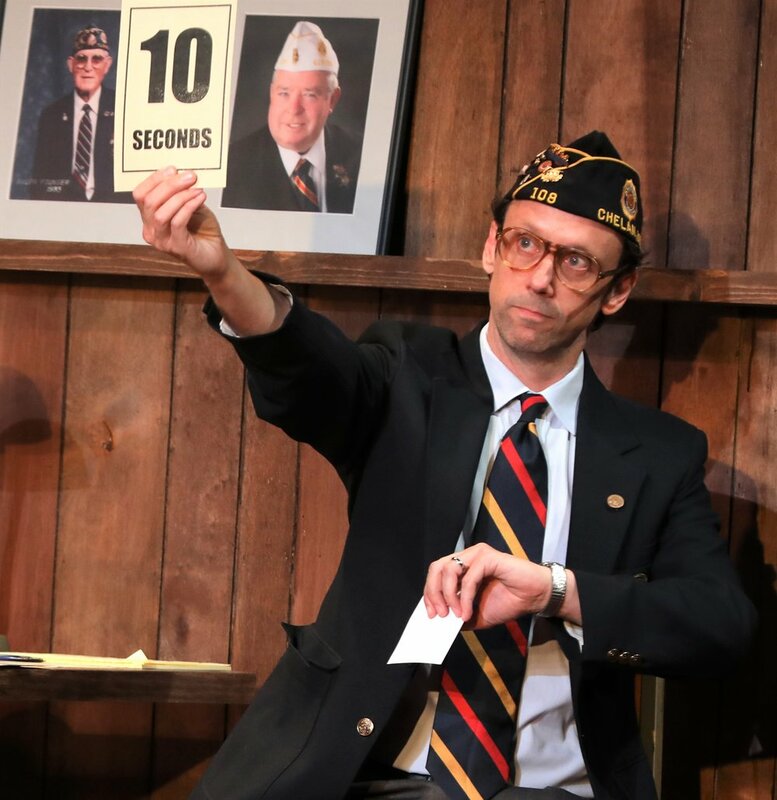 Mike Iveson as a member of the American Legion in What the Constitution Means to Me. Top: Heidi Schreck makes the political personal. What the Constitution Means to Me is built on such fluctuations of identity, with Schreck slipping in and out of character as her younger and current selves. Her conversational introduction engenders an easy and immediate intimacy with the audience. Raised to be “psychotically polite,” Schreck is a generous, responsive entertainer, tailoring her performance to the crowd’s humor and at one point waiting for an overwhelmed patron to leave before continuing a story of abuse. Hers is no vanilla presence, however; after a few more walkouts, she conceded that “those of you who are still here seem to be nice.” Schreck spends most of the evening playing her current self, so What the Constitution Means to Me might be more appropriately termed a stand-up routine than a play. This obscuring of identity, so well-suited to the theater, at once broadens and limits the play’s scope. The stories of Schreck’s great-grandmother, a mail-order bride from Germany who died of “melancholia” in a mental institution at age 36, and her mother, who was repeatedly sexually abused, are affecting and horrifying. Yet it is never apparent if Schreck is speaking as herself or as the version of herself created for this play, and when she conjures tears at her ancestors’ trauma, it’s hard to not feel like the audience is being taken for a ride, or at least instructed how to feel. Rosdely Ciprain debates the Constitution’s virtues. Photographs by Joan Marcus. 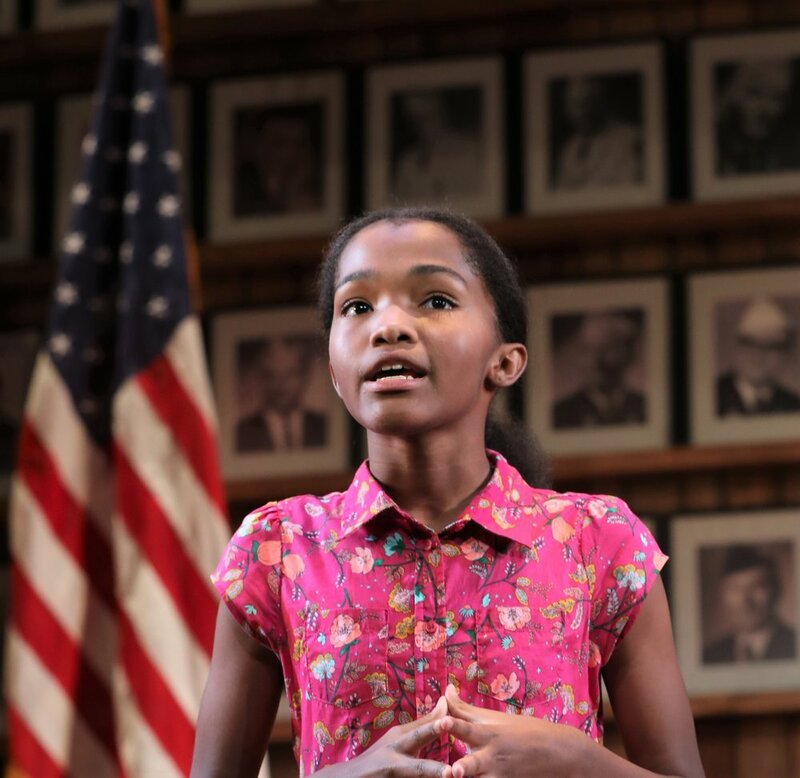 The play’s coup is the inclusion of a high-school-age debater from New York City; Rosdely Ciprain and Thursday Williams alternate in the role. Though the debater doesn’t enter until late in the show, her arrival brings the hope that allows Schreck to cope with the “staggering facts of violence against women.” Schreck and her young companion engage in playful scripted debate, again uneasily walking the “real”/performed divide, but the vision of young, diverse womanhood leading the charge is undeniably moving. To call What the Constitution Means to Me timely is to state the obvious, yet it’s sheer theatrical serendipity that this play, long in development, should come out right when the confirmation of a new Supreme Court Justice is affirming our country’s ugliest tendencies. There is no period in the history of this country, though, in which its anti-patriarchal message would not be timely; that’s the whole point. Schreck demonstrates again and again that women’s bodies, just like those of African-Americans and all immigrants deemed “bad,” have been left out of the Constitution from the beginning. At the end of the play, Schreck and the young debater model community-building by asking each other questions submitted by audience members. Yet despite the evening’s timeliness, its optimism feels increasingly ingenuous. The play’s final line, “Are we done?” spoken by the young debater as a comedic throwaway, is chilling in ways the play neither intended nor can do much about. Heidi Schreck’s What the Constitution Means to Me plays through Oct. 28 at New York Theatre Workshop (79 E. 4th St.). Evening performances are at 7 p.m. Tuesdays through Thursdays and 8 p.m. on Fridays and Saturday; matinees are at 2 p.m. Saturdays and Sundays, with a special 7 p.m. closing performance on Oct. 28. For tickets and information, visit nytw.org.